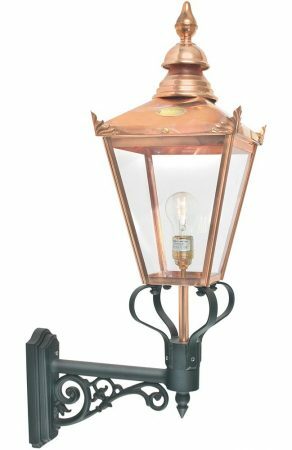 This Norlys Chelsea 1 light pure copper upward outdoor wall lantern with clear panels and rated IP44 features extravagant Victorian style. Cast aluminium wall mount in black, with detailed scrollwork bracing and tapered four-sided replica gas lantern in pure copper. Featuring a top finial, domed vents and sloping roof, with corner finials, clear polycarbonate panels and single top mounted lamp bulb. Hand crafted by Norlys, a Norwegian manufacturer who offer an unrivalled 15-year structural guarantee. If you are searching for quality outdoor lighting to complement your traditional or period home, this copper wall lantern should be considered. It looks fantastic on any outside wall to welcome visitors to your door after dark. This lantern is not lacquered and the copper will age naturally over time and acquire an antique brown patina. A corner bracket is available to mount this wall light on the corner of a building, please see the C/BKT4. A class II double insulated fitting, no earth required and suitable for older properties without an earth loop. This exterior light is supplied by Elstead Lighting and manufactured by Norlys, a Scandinavian company with 50 years experience in the design and manufacture of exterior lighting designed to withstand tough climatic conditions, such as the Chelsea 1 light pure copper upward outdoor wall lantern with clear panels and rated IP44 you see here.